JERUSALEM — The president of the popular American craft chain Hobby Lobby has opened a temporary Bible exhibit in Israel in his effort to educate visitors on the history and contents of the Scriptures. 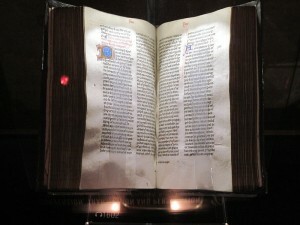 The exhibit, called “Book of Books,” is located inside the Bible Lands Museum in Jerusalem. Green flew to Israel with his wife Jackie on Wednesday for the exhibit’s unveiling the following day, and took a tour of the Holy Land, including the Via Dolorosa. The display features a large collection of manuscripts, including the fragments of the Septuagint, the Codex Climaci Resciptus (one of the oldest copies of the Bible written in Palestinian Aramaic) and a large portion of the Gutenberg Bible. Visitors are also provided iPads to enhance their experience. The majority of the items belong to the Green family, which possesses the world’s largest private collection of Biblical manuscripts. The exhibit has reportedly been four years in the making, as the museum has been mulling over how to display the items without offending non-Christians. But Director Amanda Weiss told The Times of Israel that she understands the importance of the display. The Greens are simultaneously working on opening a museum in Washington, D.C., which will also focus on the Bible and similar artifacts. Last month, Steve Green announced that he had obtained “the oldest Jewish prayer book ever found” and would add it to the D.C. collection. The Greens have over 40,000 pieces to their name, which they began collecting in 2009. Portions of the Dead Sea scrolls, a historic translation of the Psalms to Middle English, tracts from the reformer Martin Luther and a copy of John Wycliffe’s New Testament are all expected to be included. He says he just wants people to know the Scriptures and their history. “[T]he more people know about the Scriptures, the better, and hopefully, the more they will be engaged with God’s word,” he told the Jerusalem Post.